Come aboard and meet some like-minded people on a cruise that is as awe inspiring as it is relaxing. The standard cruise that they offer you is a non-stop circular cruise departing from their base in Castlefield, Manchester City Centre on the historic 250 year old Bridgewater Canal. 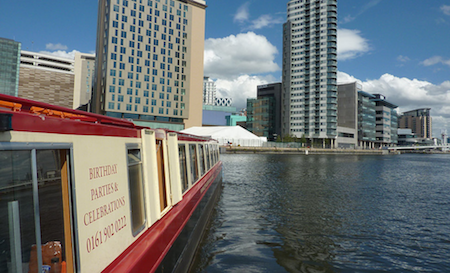 On this voyage you get the experience of being both lowered and raised in Pomona Lock and have some of the best water views of Manchester, Trafford, Salford Quays and Media City UK. With full central heating, their licensed fleet operates all year around, day and night.